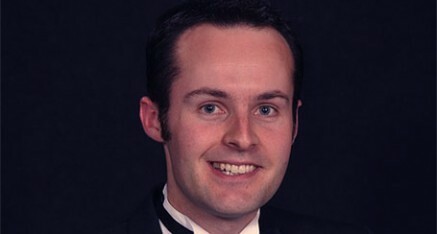 Sean Webster studied in his native Edinburgh and at Trinity College of Music, London where he was TCM Trust scholar, winner of the Director’s Prize and Isabelle Bond Vocal Gold Medallist. As a soloist, Sean has appeared throughout the UK and abroad in such venues as the Royal Albert Hall, Kings Place and St. Mark’s Basilica, Venice with ensembles including The BBC Symphony Chorus and the London Festival Orchestra. He has also broadcast regularly on BBC Radio and television and is increasingly in demand as a recitalist on board the Cunard and P&O cruise ship fleet. On stage, he has performed various roles from Argante (Handel’s Rinaldo under Nicholas Kraemer) to the Major General (Gilbert and Sullivan’s Pirates of Penzance). Sean has performed in masterclasses with artists such as Ann Murray DBE, Simon Keenlyside, Ryland Davies, Robert Tear, Malcolm Martineau and Eugene Asti. While at TCM, Sean was a finalist in all song competitions and won the English Song Competition in 2011. He has worked with vocal ensembles and consorts including Arcangelo, Ludus Baroque, Cappella Nova and Blossom Street, with which he has performed in venues including Wigmore Hall and Palacio Real de Madrid, and recorded for Resonus, Naxos and Delphian Records. Solo performance highlights include Mozart’s Great Mass in C Minor under Sian Edwards, Daniel-Lesur’s Le Cantique des Cantiques (BBC Proms 2010) and Handel’s Judas Maccabaeus (London Handel Festival 2010 under Laurence Cummings). Sean has twice appeared at Leeds Lieder+ Festival where he gave a recital of English song, and regularly performs at the Edinburgh Festival Fringe. Plans for the 2014 season include a recital series in Germany, the role of Garibaldo in Handel’s Rodelinda at London’s Southbank centre, and an appearance at the London Song Festival.